Into two clean jars with lids, pour in an equal portion the apple sauce, milk, honey, and spices into each jar. Stir the ingredients. Spoon an equal portion of the oats into the jars and mix the oats into the other ingredients. Put the lid on the jar and place in the fridge overnight. To make the topping, spoon ghee or butter into a hot pan over medium high heat. As soon as it is melted add in the apples. Stir apples around to get the pieces coated in the butter. Sprinkle the spice mixture over top and pour in the maple syrup. Reduce heat to medium so that the apples don't burn. Store the apples in an airtight container overnight. 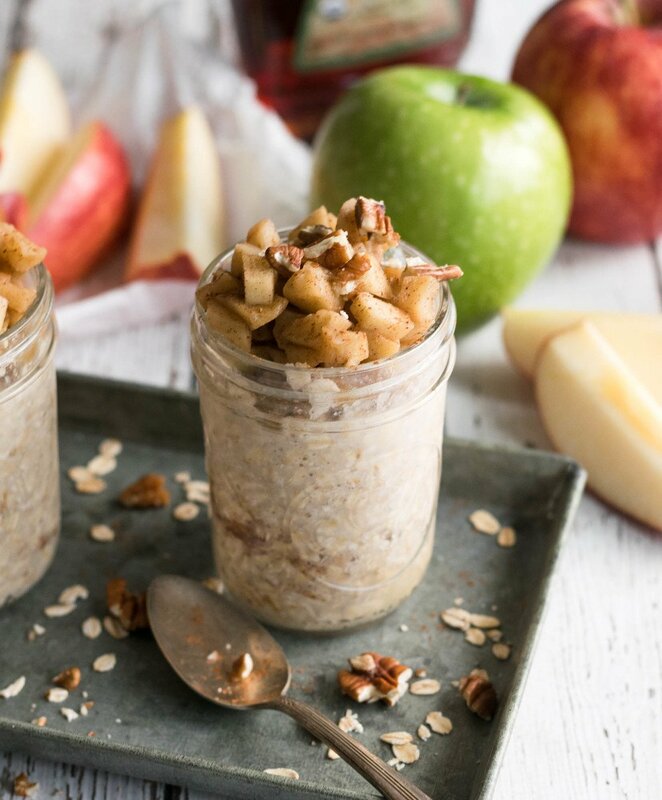 When ready to eat, spoon apples over top of the oats. Top with maple syrup and pecans (optional).